A recent task force report commissioned by the White House outlines policy changes that would promote economic development in rural America, while noting the importance of e-connectivity and electric co-op efforts to facilitate it. U.S. Secretary of Agriculture Sonny Perdue unveiled the report Jan. 8 at the American Farm Bureau’s annual convention in Nashville, Tennessee. The report sees robust and reliable e-connectivity is a critical ingredient for rural prosperity, including the deployment of smart grid technology throughout rural power systems. 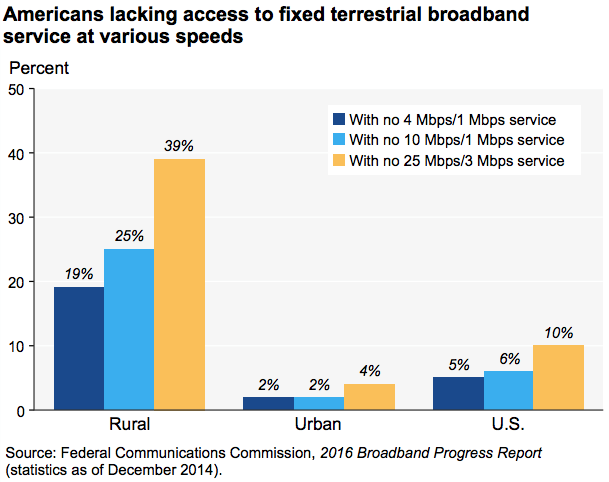 As of 2014, 39 percent of the rural population lacked access to broadband at speeds necessary for advanced telecommunications and data transfer capability, according to the report (see chart for comparison with urban and national populations). At the Monday event, President Trump signed two related executive orders. One requires the Department of the Interior to ease access to towers and other infrastructure the department manages. The second calls for departments and agencies to reduce barriers to capital investment and government resources to enable rural broadband projects. The full task force report is available online from USDA.